IKEA is making loads of money in Russia. Wait, what? Russia's economic crisis has forced furniture buyers to be savvier about prices and IKEA has benefited. Crisis or not, Russians love those IKEA bookcases. IKEA, the Swedish flat-pack furniture maker, is doing really well right now. Global sales jumped 11% to 32 billion euros ($35.8 billion) in the year to August. The impressive growth was partly fueled by success in Russia, where the economy has slumped into a deep recession over the past year. Many companies scaled back their Russian operations, as real wages declined and the economy started to shrink because of low oil prices and Western sanctions. Not so IKEA, which said Russia was its second fastest growing market last year, beaten only by China. That's because Russians started to worry a lot more about their money. The ruble plunged over 50% in 2014. 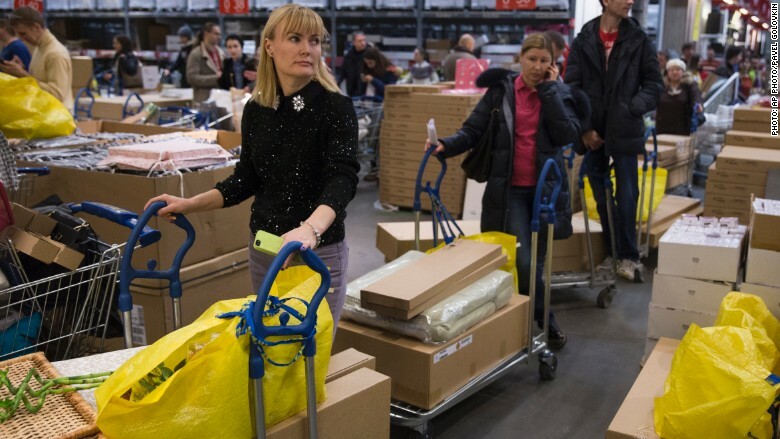 Russian shoppers swamped Ikea and other western retailers in anticipation that prices would rise sharply as a result. "Consumers were afraid to lose their savings and of possible future high price increases," said Marija Milasevic, senior analyst at Euromonitor International. "They were massively purchasing durable products," she added. IKEA spokeswoman Josefin Thorell said the company had seen a "temporary increase" in the number of people visiting its Russian stores as a result of the currency collapse. IKEA was forced to halt sales of more expensive items such as kitchens and home appliances for a while due to the large number of orders. And as the economic crisis deepened, Russians turned to IKEA as they looked to make their money stretch further. "Consumers became much more rational in terms of their spending," Milasevic said. IKEA, which is privately owned, has been in Russia for 15 years and is now the leading furniture retailer with a 20% share of the market, according to Euromonitor data. It operates 14 stores and is looking to open a new one in Moscow, its fourth in the Russian capital.